Please join us for this year's Leif Erikson Day! 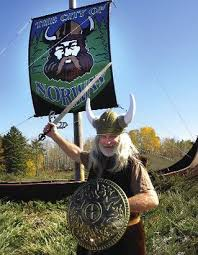 Planning is underway for our 2018 Leif Erikson Day. Stay tuned for details coming soon! The dates will be October 5, 6 & 7th. We are always the weekend of Columbus day. We hope you'll join us! 4:00pm- 6:30pm Jake Menghini Museum Invitational Art Exhibit﻿ at the Jake Menghini Museum, O’Dill Road near train tressle on west side of town. Children’s Activities, made your own Viking costume! 10 am - 4 pm at the Jake Menghini Museum, O’Dill Road near train tressle on west side of town. 12pm- 2:30pm Norton & Chartier at the Bandshell, 900 block of Main St. Hear all your favorite classic rock songs from bands such as The Little River Band, The Eagles, The Beatles and many more. 12:45 pm Bandshell Activities, 900 Block of Main St.
8:15 pm Torchlight Parade around Strawberry Lake. “Funeral Pyre” boat burning following night parade. Meet at Knights Kingdom. All welcome. Bring flashlights. Copyright 2014 Leif Erikson Festival. All rights reserved.